The Art Institute of Chicago has been publishing award-winning scholarly and popular print catalogues for decades… but is this model sustainable? Digital publication appears to hold great promise for both user experience and global reach. To achieve these bright outcomes, however, institutions need to approach the challenges and opportunities of digital publication with creativity, willingness to reorganize around new ideas, and the careful and adequate resourcing of this vitally important publishing agenda. In this paper, we share the Art Institute of Chicago’s experiences gained from forging new integrated print and digital publishing workflows. Specifically, we focus on our process and learnings from the Getty-funded Online Scholarly Catalogue Initiative (OSCI). 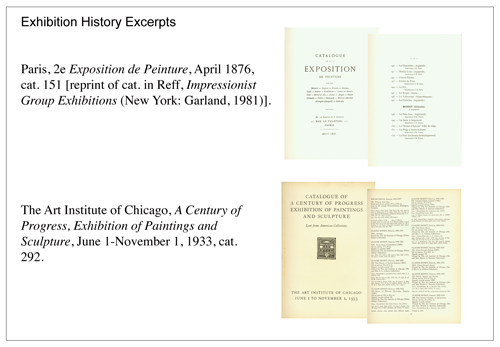 The Art Institute of Chicago has a long history of publishing highly regarded printed collection catalogues. 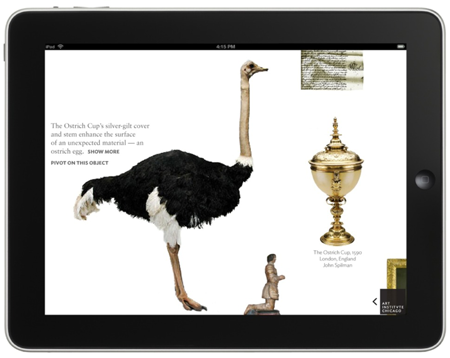 As with most museums, it has also been delivering information about the objects in its collections through a number of digital channels, including online databases, exhibition micro-sites, gallery interactives, and mobile apps. For the past 18 months or so, members of the AIC staff have been deeply immersed in envisioning a new technological environment to support authoring and publishing scholarly catalogues in a digital form that will meet or exceed our established ink-on-paper quality threshold. We have committed to this undertaking because digital publication will make possible unprecedented access to our scholarly catalogues – the affordability and thus the very circulation of which has always been severely limited by the high cost of print publication. This work was motivated and generously funded by a two-year planning grant from the Getty Foundation as part of the Online Scholarly Catalogue Initiative (OSCI) that Nik Honeysett has described in his paper “The Transition to Online Scholarly Catalogues” (2011). The primary focus of this paper is our OSCI work and our vision for digital publication activity in the near future. We also touch upon how we are beginning to integrate all of our publishing workflows to maximize our efforts. The substance of the OSCI publication is not dissimilar to other major scholarly collection catalogues produced by the AIC and other museums in the past 10 or 15 years, characterized by the breadth and inclusiveness of research presented. The contents of this new volume, written by curators Gloria Groom and Douglas Druick, with research associate Jill Shaw, will be the 49 paintings and 23 drawings by Monet and Renoir in the museum’s collection. Structurally, the entries will present basic object information, an illustrated art historical essay, comprehensive provenance, an exhibition history, selected bibliographic references, and numerous comparative illustrations. Each entry will be enhanced by sections containing primary archival information on the collectors, images of all signatures and distinguishing marks, and a glossary of technical terms used in the volume. In addition, extensive reports on analytical examinations, authored by conservators Kim Muir and Kelly Keegan, will follow the entries and include copious technical imagery, details on support and technique, pigment analysis, and condition assessment. Utilizing digital tools, we will be able to present a “360-degree view” of the many kinds of interconnected analytical evidence that informs modern art historical discourse. This presentation will allow online readers the chance to understand the pictures through the curators’ and conservators’ eyes – as well as to have the unprecedented opportunity to explore the primary evidence in an interactive environment and to develop their own conclusions. Before we delve into the subject material, a note about our current position on the timeline of the project. We are now in the final stages of a two-year planning grant from the Getty Foundation, the deliverables of which will be: 1) a functioning prototype of our online scholarly catalogue and 2) the plans for its full implementation. Recognizing the complexity of the task at hand, the Getty has given each of the grant recipients the time and support necessary to really think outside of the box and to carefully plan the two- or three-year implementation phase, which we hope will start on July 1, 2011. As such, what we present in this paper is still very much a work in progress, and there are several components that have yet to be fully worked out. We thought it would be useful, however, to give this community an early update on these activities as we feel that we have made considerable progress and wanted to share our findings to date. While it is certainly true that the actual deliverable of the OSCI grant will be one online catalogue, the overarching thrust of this work goes far beyond a single volume. 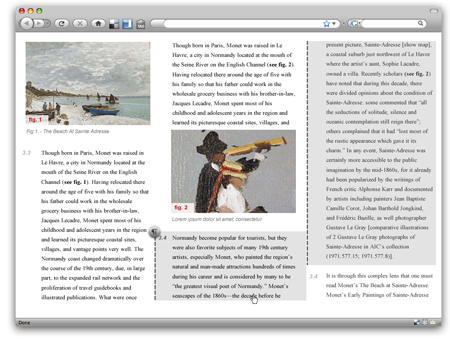 Guided by the needs of the Renoir and Monet publication, we have set out to develop a digital authoring and publishing environment that will have enough flexibility to facilitate the production of this volume as well as future catalogues of other groupings from the museum’s collection. In addition, this environment will ease the compilation and maintenance of the resulting scholarship as a part of the institutional information repository (a topic to be further addressed below). The clear and well-articulated desires of the present authors will have an indelible formative effect on what system we produce, and it has been extremely useful to have such experienced yet forward-thinking authors directing our development. We nevertheless remain mindful that we are building a technological environment that will be used in many unforeseen ways in the future to produce what might very well be widely divergent publications. From the very inception of the project, the OSCI team included department heads and leading staff members from our curatorial, conservation, publications, and technology groups. As such, it represents a wide variety of opinions about what an online scholarly catalogue could or should be. We considered the gamut: from using the Internet only as a distribution channel by mounting a .PDF of what might otherwise be a printed book, to envisioning a fully dynamic and searchable database – much like our current online resource – with much more depth and breadth of content. Through numerous team meetings we came to target a point along the continuum defined by those two extreme positions. We decided the publication should be something that simultaneously supports the linear narrative as conceived by the authors and stands as a resource suitable for searching and browsing. In the context of these discussions, we also came to realize that we were very committed to encouraging digital scholarship among an art historical community that could be characterized as somewhat skeptical of the perceived impermanence or unpredictability of digital publications. It followed that we needed to remain mindful of this anxiety and focus our efforts on guaranteeing an essential attribute of scholarly publication: its ability to be reliably cited by other scholars in their own research and writing. Recognizing that our community may not be fully comfortable with the existing tools and protocols to cite online work, we therefore decided to produce a more book-like digital publication, something that we hope will be perceived as more stable and reliably citable within the digital environment. Even though the authoring and publishing environment will be capable of frequent or even automatic updating, we will be in control of how this capability is applied to any given effort. For the present Renoir and Monet catalogue, for example, we plan on updating the volume only infrequently and at an extremely deliberate pace. Indeed, the pace of revision we have in mind might otherwise be considered as the publication of new, discrete, and date-stamped editions, appearing with a number of years in between. We take this position knowing that in parallel, residing elsewhere on our Web site, our existing online collections database (http://www.artic.edu/aic/collections/) will include all of the works discussed in the online scholarly catalogue; unlike the proposed catalogue’s contents, this database is subject to constant updates and revision. Links between the two resources will allow readers to access the most up-to-date factual information from the database, while allowing them to explore the full interpretive and archival resources of the catalogue as it was published at a specific moment in time. As many readers may remember, the evolution of digitally publishing museum collections information began with the repurposing of the only fielded data most museums had: namely, typed index cards or their equivalent. Unfortunately, that data, accumulated as it was for practical institutional purposes, only provided the barest basis for an engaging, public-facing presentation of the museum’s collection. As a result, most of us have been attempting to augment our collections management systems with interpretive information ever since. The solution to the big challenge we have all faced – that is, integrating scholarly catalogue content back into our databases – has been thoroughly elusive. This is largely because the publishing software used, such as Quark™, Adobe InDesign™, and Adobe Illustrator™, have not had useful conduits back into our various collection management systems. Furthermore, museums have rarely if ever mandated that our publication departments manually update collections management information. Thus, we are hopeful that the development of this new environment that will be capable of both supporting digital authorship as well as maintaining its resulting product as live data will move us further toward the goal of augmenting our databases with these publications. Furthermore, such a system – designed to accommodate footnotes, references to external resources, and other pointers to areas for further research – will transform our collections management systems into repositories of knowledge by maintaining not only factual and interpretive information about the objects in our collections, but also evidence of the very process of scholarship. This in turn will propagate future work by making the collections management system not just an institutional record, but also an active agent of collective scholarly research. To achieve these ambitious goals, we know the institution will need to make fundamental changes in the way several departments are organized and staffed. We are beginning to understand what new digital skills our professional staff will need to pursue and cultivate in order to meet the needs of this new publishing paradigm. It is not yet apparent how the OSCI project will transform the AIC organizationally for future digital publishing initiatives. It may be that the discussion of roles and responsibilities and how they will change is just too speculative at this time. It is certainly premature to start tinkering with the very slim staffing resources we have in these areas. At this stage we continue to be committed to publishing ink-on-paper catalogues in addition to forging ahead into the digital realm. Much remains to be seen – the economics, the level of acceptance, the changing technological environment – before we determine the balance between print and digital publishing activities in the future. Regardless, we continue working in a highly collaborative style with our current staff in their present configuration in order to anticipate and guide the institutional response to emerging needs. The Art Institute OSCI team embarked on the discovery phase of our online catalogue by considering and enumerating the anatomy of our scholarly print catalogues. We wanted to bring our rich institutional experience with paper-based catalogues to bear in this new mode of publishing. We began by considering how these print catalogues are used in scholarly research: how the scholar finds an entry, moves between entries, holds the book, makes notes, reads footnotes, etc. Concurrently, the team benchmarked Web sites intended for scholarly audiences; such as the National Gallery of Art, UK Raphael Research Resource (http://cima.ng-london.org.uk/documentation/index.php) and the Rijksmuseum Early Netherlandish paintings in the Rijksmuseum, Amsterdam. Volume I – Artists born before 1500 (http://www.rijksmuseum.nl/early-netherlandish-paintings?lang=en). 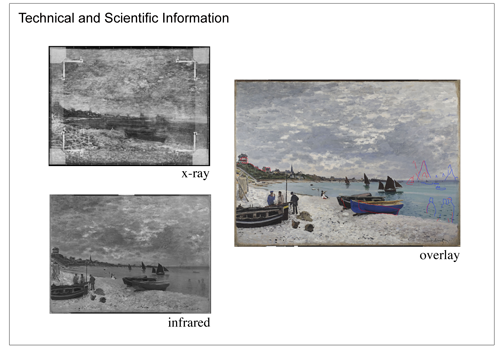 To define the new challenges and opportunities associated with an online catalogue, our curatorial and conservation teams dived into the research for a representative artwork, Claude Monet’s The Beach at Sainte-Adresse, 1867. Because our OSCI project proposal included original research, we had the luxury of considering the uniqueness of this publication from the outset. The research team met often during the nascent stages of the project to rethink the scope of conservation and archival information that would best support the entries. We referenced various online resources providing extensive conservation information, such as the Wallraf-Richartz Museum’s research project Painting Techniques of Impressionism and Postimpressionism (http://www.museenkoeln.de/ausstellungen/wrm_0802_impressionismus/info_e.asp?lang=en). The research team developed new templates and workflows for conservation reports, technical image capture, and art historical research to optimally document the research process. These materials are essential to the online catalogue; we had a strong desire to reveal and give access to many of the resources we had reviewed and incorporated into our technical reports and art historical essays. While developing the pilot entry, the team members were mindful of the types of information and resources they used and questioned whether the constraints of the old, paper-based media would apply to its new, digital manifestation. Without the page limitations faced by print publications, how much of this information should be made accessible to the reader in support of the arguments in the text? Some technical imagery and archival assets may have been consulted in the process, but not deemed central to the narrative – should these assets also be included? Budgets and schedules for our print publications center around the number of pages in the book, the number and nature of illustrations, the quality of the printing, and the extent of the design work. In the digital publication of a scholarly catalogue, where the incremental cost of including more text and illustrations is much lower than that for the printed page, we needed to determine new editorial criteria to define the published outcome. We wanted to provide the reader with much more access to our scholarly processes through illustrations, primary sources, and information about the collectors. On the other hand, we also had a strong attitude that “more is not necessarily more.” The team sought a “sweet spot” where the number of supporting resources would give the scholar optimal access to materials without detracting from the entry. With a complete pilot entry in hand, the team was in a position to better define the types and breadth of information available for the online catalogue. Thinking about content, audience, and available staff resources drove the discussions for developing a publishing strategy. We determined that our online catalogues would present text, media, and data to support specific arguments made in the entry. Therefore, the resources and technical imagery included in the catalogue presentation would be those assets directly referenced within the text. Arguably, all resource materials consulted – even when not referenced – could accompany the online entry, but we wanted to maintain the scholarly focus of the publication as opposed to developing an online archive. Even with this imposed limitation, far more resources and images will be available online than are typically in a print publication. Additionally, a separate section of the entry will be dedicated to a fielded conservation report with extended technical imagery and interactive documentation. The research team worked with our publications department to identify portions of the institution’s scholarly style guide that should be revised for an online presentation. We needed to acknowledge that online, a reader may find an entry through a search engine and need to be instantly oriented to our catalogue from any page. Specifically, the team rewrote footnote rules to avoid using contextual conventions such as ‘ibid’ and ‘op cit’. Also, some fairly obscure provenance syntax rules were eschewed in favor of more explicit, time-consuming narrative explanations. Building from the pilot entry, the team developed a content inventory with high-level requirements for formatting and data relationships. From this process emerged the necessity for extensive footnoting and linking to references. These references provide the background documentation and reasoning used to argue the thesis of the text, making them critically important to the scholarship of the publication. This extensive linking introduced complexity for both the user interface navigation and back-end data organization. We have spent much time and effort developing creative and effective solutions for this major challenge. We believe that the success of our online scholarly catalogue rests on providing an exceptional online reader experience. We intend to develop a well-executed online interface with interactions focused on the needs of a scholarly audience, enabling unprecedented access to the unique intellectual content and research of our authors. To specify an online experience for our intended audience, we concentrated our efforts on defining digital analogues to convey the essence of a scholarly print publication. We issued an RFI to gain the expertise of a knowledgeable user experience consultant. In March 2010, we conducted interviews with potential candidates and further honed a desired scope of work for this stage of the process. After careful consideration, the Art Institute engaged IMA Lab from the Indianapolis Museum of Art based on their proposed approach to our OSCI project, their essential awareness of museum information, and their demonstrated ability to quickly suggest potential solutions to key project challenges. The team from IMA Lab, led by Rob Stein and Charlie Moad, is well respected for its leadership in technology and museum collections information delivery. We also believe that a museum-to-museum endeavor will yield great benefits for the overall OSCI project and the museum community in general. During this planning grant phase, IMA Lab is developing creative solutions to user experience challenges and a functional prototype of our digital authoring and publishing tool. Many of the innovations we see influenced by the iPad improve the experience of digital reading, often by craftily emulating features from print publishing, such as columns, horizontal page ‘turning’, and inline imagery. With IMA Lab, the AIC OSCI team has been taking cues from iPad apps and other emerging opportunities with HTML 5. Because our initial goal is a prototype, we have the luxury of implementing experiences that may not yet be compatible across all platforms or browsers. We believe that all browsers will eventually catch up with these exciting changes. One of the key facets of IMA Lab’s proposal allocated significant time for rapid prototyping of user experience ‘experiments’. This approach allowed for hands-on testing of innovative approaches to user experience challenges as the scholarly catalogue was re-imagined in an online mode. Based on feedback from the Art Institute team, these experiments were either iterated and further polished or discarded in favor of other directions. We settled on nine experiments on which to focus: page layout, citation, footnoting, access to large imagery, user-generated annotation, bookmarking tools, technical imaging tools, non-linear navigation, and print/EPub support. These experiments have led to exciting out-of-the-box responses to the scholarly publishing challenge. When using a print catalogue for research, one often uses a finger or some other type of bookmark to quickly reference the main plate image for a catalogue entry. In benchmarking, we had not seen an adequate replacement for this easy, ever-present access to the image. IMA Lab proposed using a hot spot on the iPad or a hot key on a computer keyboard to activate an overlay of the plate image at any time that, in spirit, mimics the practice of flipping back to it in a printed catalogue. For readers with larger or multiple screens, there will also be the option to open the image in a separate window. When scholars use a printed catalogue, they often highlight text for emphasis, insert sticky notes to bookmark pages, and make notes in the margins for future reference. 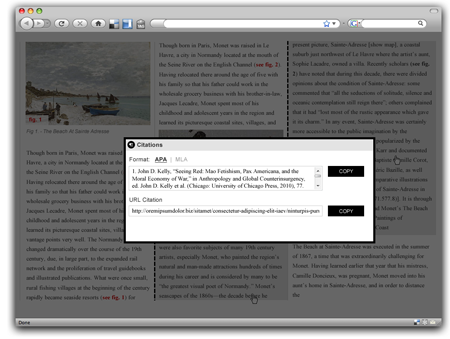 We wanted to allow scholars similar ways of annotating the online catalogue by developing a set of reader study tools. Readers who want to take advantage of these tools will create an account and essentially have their ‘own copy’ of the catalogue. 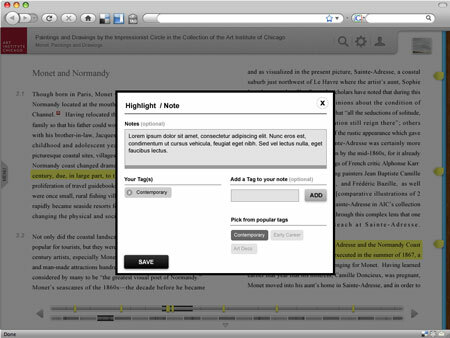 Scholars will be able to highlight text and save notes anywhere in the text. Each scholar will also be able to organize saved notes using personal tag categories to aid in the research. Once applied, notes with a particular tag could be searched to compile lists of similar thoughts and provide jumping-off points for further research. We found tagging to be more powerful than color-coding because one note can be tagged with multiple categories. Current online citation standards are inadequate in meeting the transition to online scholarly publications. Because an online publication may be accessed by any number of devices – desktop, laptop, iPhone, iPad – the idea of a fixed ‘page’ for a citation is no longer a stable or relevant concept. We chose to employ a paragraph numbering system for citations and a search function for references. A citation interface tool will be developed to facilitate using our preferred paragraph citation standard within various established formats such as APA, MLA, or CMS (Chicago Manual of Style). Invoking the project’s goal of focusing on the scholarship of the text, the team also agreed that it may sometimes be important to constrain the interactivity of the presentation to clearly illustrate the author’s intentions. While the reader would still be able to interact to some degree with the image, that interaction would be focused on reinforcing the idea in the text. A significant measure of success for our online catalogue will be the development of an intuitive, streamlined authoring experience for those who are writing the catalogue. To leverage existing institutional relationships and expertise, the team and IMA Lab made every attempt to mirror existing print publishing workflows in the design of the authoring tool. While both the curatorial and publications staff are cognizant of the unique features and opportunities available from an online publication, the major tasks of planning and authoring the catalogue text should focus on the production of scholarly content – not the intricacies of a technical tool. IMA Lab proposed an authoring approach they pioneered using Wiki-syntax within the Drupal Web content management system, as described in their 2010 Museums and the Web paper “Breaking the Bottleneck: Using Pseudo-Wikis to Enable Rich Web Authoring for Non-Technical Staff Members” (Stein & Bachta, 2010). To further ease the burden of publishing online, IMA Lab developed a tool using the familiar ‘cut and paste’ rubric to convert an entry from Microsoft Word™ into a wiki-tagged html text with automatically parsed and stored footnote and figure information. Alternatively, content can be authored directly in the Drupal Pseudo-Wiki authoring system and marked up manually. Digital editorial skills need to be developed and honed to take advantage of and identify opportunities for rich metadata linkages, compound navigation layers, multimedia preparation, and search optimization. To this end, we will develop refinements to our internal scheduling and workflow to support the production of the online catalogue; this will be an important outcome of the overall OSCI project. The IMA Lab and Art Institute teams will work closely to ensure that the technical underpinning of the catalogue matches the eventual workflow. As stated above, our goal for the OSCI project is not only to author a catalogue, but also to build a digital authoring and publishing environment for future publications across multiple curatorial areas. The Art Institute’s OSCI software approach allows for adaptable navigation strategies and flexible sets of user interface layouts to accommodate the specific narrative needs of individual catalogues while still sharing a common underlying platform. We are committed to using open-source tools and developing in a modular manner to best accommodate our own needs, as well as those of the larger museum community. As with any custom-developed software solution, ongoing support resources will be required to maintain this software and its corresponding infrastructure. While its development is still in the conceptual phase, we plan to employ a Drupal 7 middleware authoring environment where each catalogue’s elements are constructed and connected to external data assets in preparation for publishing. (See software illustration.) The middleware and front end will be built on the catalogue prototype authoring tool developed by IMA Lab. Integration with CITI, our collections information management system, and other digital asset repositories will occur after the prototype has been developed and tested. Perhaps the largest technological challenge is the continued augmentation of CITI as a sophisticated digital publishing engine. Though CITI currently publishes and categorizes data for various online initiatives, the scholarly catalogue requires much more extensive formatting and footnoting than previous digital publications. With the vision of publishing that OSCI provides – that is, a flexible and replicable publishing tool attached to an institutional repository – we have the opportunity to create a properly crafted system that both enables authoring and publishing and maintains and manages further versions of the resulting publications. In concept, we will be building a module using open-source tools that can be bolted onto CITI or, we hope, any other institutional database, whether it be TMS, MIMSY, or EMu, etc. Parallel to this effort would be the work necessary to make it possible to access the contents of the authoring and publishing tool from within a CITI record. By mid-summer 2011, a significant amount of the curatorial research for the 72 works of art will be complete. Conservation work documentation will also be complete and ready for editorial review. We will have a working prototype of the online catalogue authoring and publishing tool populated with a representative set of complete entries. Based on the findings from prototype testing, we will outline a detailed specification for enterprise integration and move into the implementation phase of the project. In this phase, the Drupal middleware authoring environment will be attached to CITI and the research and editorial teams will finish the remaining Monet and Renoir entries. The projected publication date for the catalogue is the summer of 2014. Concurrent to the OSCI project, we are working on a separately funded initiative called the ‘Martin Interactives’ project that aims to provide rich multimedia interpretive content to visitors in the European Decorative Arts galleries. The goal, in the words of the project’s generous sponsor, Melinda Sullivan, is “to engage visitors and dramatically enhance their appreciation and understanding of the objects on view” (2009). For the Martin Interactives project, we are designing a user experience focused specifically on the needs of visitors in the galleries, needs that are very different from the needs of OSCI’s scholarly audience. However, since both the Martin Interactives and OSCI projects require the creation and presentation of object-centric material linked to our collection management system, we plan to design the authoring and publishing environment with enough flexibility to accommodate a range of user experience requirements. Applying the modular approach previously mentioned, we aim to leverage our efforts in all collections-based publishing and offer similar tools to support the curatorial work of producing and organizing content for digital publication, institution-wide. 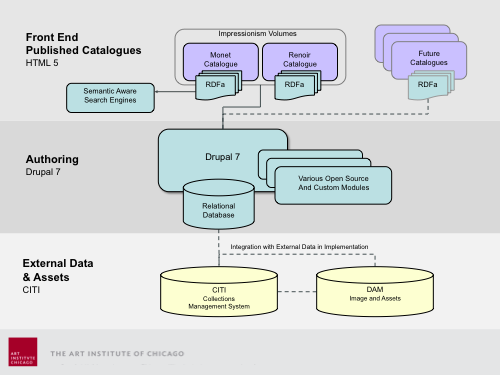 Though the Martin Interactives deliverable is intended specifically for the European Decorative Arts galleries, its underlying goal – much like that of OSCI – is to produce a scalable system which can be used in other suites of galleries in the Art Institute. Since April 2010, when we engaged Scott Sayre of Sandbox Studios to manage the project, we have been working to produce a prototype installation scheduled for May 2011. This initial installation will test both the success of the user experience, designed by Lisa Strausfeld of Pentagram, and three different physical installation solutions for iPads: one that is stanchion-mounted, one mounted on a wall, and one mounted adjacent to a bench, to be used while seated. 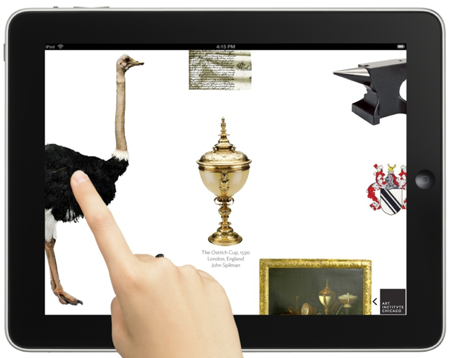 In July 2011, development of the authoring and publishing environment specific to the gallery touch screen presentation will begin in parallel to the OSCI implementation work. In the Martin Interactives project we are exploiting the graphical capabilities of the iPad and employing the metaphor of a ‘large canvas’ to draw the user’s focus to objects surrounded by constellations of illustrated vignettes about them. Depending on its location in the galleries, the iPad will present either an attractor screen based on objects nearby or simply the entire large canvas. The design encourages self-guided navigation and allows the visitor to dive deep into the present object or to gracefully ‘pivot’ from one vignette to another based on both a narrative implied by the relationship between objects in the constellation, as well as a more serendipitous navigation of tags associated with each object and its vignettes. The tagging feature, which will be added to the authoring environment, will support the growth and richness of the matrix of connected objects as the system is expanded into other collection galleries. We will also utilize the iPad’s on-screen keyboard and wireless connectivity to enable social sharing options and allow the user to e-mail personal bookmarks for post-visit study using the Art Institute’s Web site. While we do not envision replicating the full user experience of the Martin Interactives project online, we will include all of its digital vignettes as interpretive resources accompanying the object records in our online collections database (http://www.artic.edu/aic/collections/). Reusing these costly multimedia assets will be easily accomplished because we have integrated CITI into the digital workflow from the beginning. Our experiences with the OSCI, Martin Interactives, and other digital publishing projects have allowed us to deepen our institutional knowledge of and infrastructure for digital publishing. As other projects emerge, we will be able to identify and apply tested approaches to meet the needs of other audiences. For example, our Prints and Drawings and Photography Departments have nascent projects to publish their holdings and archival material related to Irving Penn and World War II/TASS Soviet propaganda posters, respectively. These projects suggest more of an online searchable archive than other digital publications projects, but we can build upon shared authoring, imaging, and tagging tools to stretch our investments in these systems. We will also make every attempt to incorporate appropriate learnings into our initial digital publications, online collections, and exhibitions micro-site framework. As is evident from the projects described in this paper, the integration of print and digital publishing workflows at the Art Institute is very much a work-in-progress. We hope that this update reveals our approach towards digital publishing challenges and explains how we intend to leverage our solutions. Perhaps the most significant takeaway is that technologists at the AIC are now being brought in from the beginning as full collaborators in publishing workflows. This is much different from past practice when, for example, we have been brought in to assemble a micro-site in a mere six or eight weeks for an exhibition that has been in development over the previous four years. As a result, we are now able not only to implement more efficient workflows, but also to collaboratively envision entirely new opportunities for effective modes of presentation that will be in keeping with the expectations of an increasingly predominant and digitally literate audience. In the coming years, we assume there will be many other updates on similar digital publishing ventures throughout the museum community. Let us continue to share and learn with one another so that collectively, we will be ready to meet these complex challenges and stimulating opportunities. Sullivan, M. (2009). Personal communication. Paraphrased from one of several discussions in December. Copyright © 2011 – Archives & Museum Informatics.